If you aren’t familiar with Change Tracking I would recommend heading out and reading Kendra Little’s Change Tracking master post which contains a wealth of information. I’ve been using CT for a while now and it does what it says on the box. The performance can be painful when querying tables that have changed a lot (the changetable function performs a huge amount of aggregation and seems to be optimized for 1000 rows of data). One of the things that I’ve always wanted to do is perform loads into an ODS from a DR site. For databases that are members of a secondary availability replica, change tracking is not supported. Run change tracking queries on the databases in the primary availability replica. Yesterday I was messing around with database snapshots and was really happy to discover that it is possible to use the changetable function against a snapshot and not receive any errors. This will only work against readable secondary replicas (as the database needs to be online in order to be able to take the snapshot). This is also the case with log shipped copies of databases. If the database is in standby then you can access the changetable function directly, or do so off a snapshot. It doesn’t seem like this is a big deal, but if you like to load data into an ODS or Data Warehouse server and it’s not located in the same location as your AG primary, then this is huge as you can asynchronously write data over a WAN and then do all your data loads local to the ODS. This is far more efficient (and your network admin will like you a lot more) than pulling the data over in a large chunk nightly and saturating a part of the network. Just another way that you can make your DR system work for you. As I’ve previously mentioned, the automatic cleanup process of the syscommittab table limits you to being able delete 14.4 million rows a day. This is a problem in a highly transactional system with volatile tables. Where the automated cleanup process let’s you down there is an undocumented stored procedure which will allow you to perform a manual cleanup of syscommittab in order to prevent it from growing out of control. The procedure sys.sp_flush_commit_table_on_demand accepts a BIGINT for the number of rows that you want to delete from syscommittab. When the procedure executes it will delete as many rows as you pass in, doing so in batches of 10,000. It will not delete any rows that are newer than the minimum cleanup date, so you do not have to worry about deleting too much data and running into a problem with no longer being able to use your Change Tracking tables. 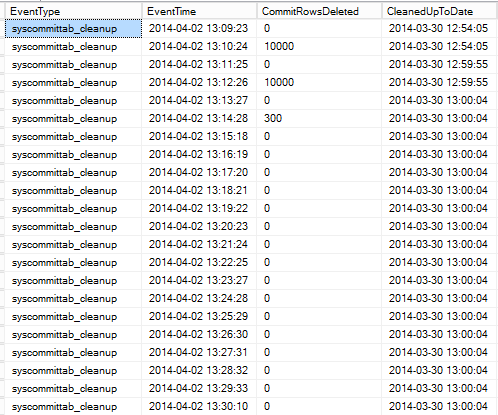 While the sp_flush_commit_table_on_demand has a deadlock priority of low I would recommend temporarily disabling the automatic cleanup process when running it, just to prevent possible locking or blocking issues with new rows trying to be inserted. It also makes the most sense to run this during a quieter time on your SQL Instance, just to reduce the impact further. Note, when re-enabling Change Tracking I’ve included the CHANGE_RETENTION information. If you do not include this then the default of 72 hours will be used. This may be too high or too low, depending on your needs, so be careful. In summation, for a busy system watch the size of the syscommittab table and if necessary run sys.sp_flush_commit_table_on_demand if the automated cleanup process cannot keep up. In my last post I wrote about a limitation of Change Tracking and in particular a limitation in the cleanup process for the syscommittab table. I thought that a quick example of seeing this in action might be useful in allowing you to check for the issue yourself. First things first, we setup a database, enable CT, create and load up a table with rows. With the table in place we create an XEvent session to capture when the cleanup runs for syscommittab. Running this shows that the cleanup process runs about every 62 seconds and only deletes 10,000 rows. Given that, there’s no way to be able to keep syscommittab under control if you run more than 14 million transactions through change tracked tables on a daily basis. I’ve been “fortunate” enough to be working a great deal with Change Tracking recently and have run into a limitation that it’s worth keeping an eye out for on your servers. If you have a database, with Change Tracking enabled, and the total number of transactions exceeds 14.4 million for all of the tables that are tracked in that database then you are going to be in for some hurt. The problem is that the process to clean up the CT data in the (internal) syscommittab table only runs once a minute, and only cleans up a maximum of 10,000 rows every time it runs. Given that it cannot clear faster than that limitation the internal table will continue to grow over time and it will cause other cleanup processes to slow down, as well as your CT queries. This is definitely an issue in SQL 2012, I have no yet checked other versions. I have a whole bunch more stuff coming on Change Tracking (including an undocumented workaround for this issue), but for now this is important to know.